The three pieces presented in this short collection illustrate different facets of my composition spanning almost thirty years, from simple representation of minimalism, to pastiche baroque style and twelve tone music with serialist elements. Although they are original compositions, two of them connect with older elements, whether through variations loosely in baroque style with counterpoint, or a musical reference to a piece from the collection of Edward Bunting. Musical dialects reflecting the compositional development of the last few hundred years are under represented in the repertoire of the lever harp: this unfortunately limits the learning experience, since the student has fewer encounters with evolutionary stages in the development of musical language. The pieces presented here go a small way to addressing this. They are of varying technical levels, all are possible on a 34-string Irish or lever harp, and pedal markings are added for Chorale Variations on ‘Deus Meus Adiuva Me’. In this publication lever changes are denoted by a stemless, diamond-shaped note head. Prelude was written for Etaoin Ní Ghabhhann and lasts 1’35 minutes. Chorale Variations on ‘Deus Meus Adiuva Me’ is a set of variations on the well known Irish hymn of the same name. The macaronic poem, Deus Meus Adiuva Me meaning ‘my God, help me’, was written in Latin and Irish by the Armagh monk Maol Íosa Ó Brolcháin (d. 1086) in the margin of an illuminated manuscript. The words are a plea for God’s grace and love, and were later set to music in the twentieth century by Seán Óg Ó Tuama, granduncle of the dedicatee, Cormac De Barra. This set of variations explores the harp’s textures using the main theme which is in the aeolian mode. Its duration is 4’00 minutes and pedal markings are also provided. 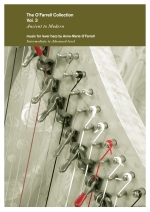 Chromatétude is edited for lever harp as its pitch structures were designed with this in mind, written for a particular lever setting set out at the start, and unaltered throughout. Originally conceived for A flat tuning, adjustments have been made so that the piece can be played on the more widely used E flat tuning. There are four sections: bars 1–23 are a free introduction, which explores chromaticisms provided through use of the upper partials of the harmonic series, using harmonics at the octave and twelfth. This is followed by a second, more whimsical passage (bars 24–37), based on a fragmented, arpeggiated pattern drawn from ascending transpositions of the quartal hexachord or ‘Prometheus’ chord. This is one of the source chords for the piece, which received its name from Scriabin’s use of it in his symphonic work Prometheus: The Poem of Fire written in 1910. The chord combines all possible types of fourths using six pitches. In this section this chord is combined with braille lettering patterns to explore the sound of the resulting serialist process. 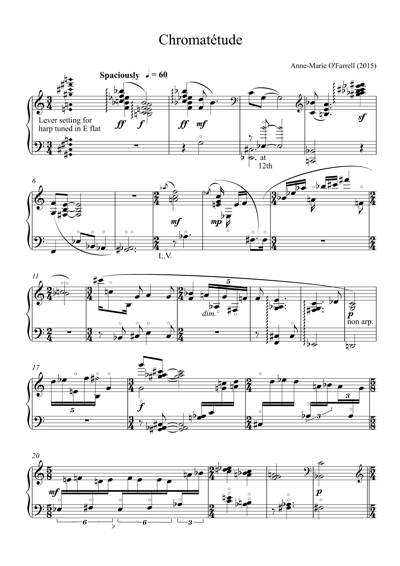 The third section of Chromatétude (bars 38–53) is a recognisable paraphrase of blind harper Denis Hempson’s ricercar, Faigh an Gléas (‘Try if it be in tune’) in Volume 3 of Bunting’s collection of 1840. In addition to providing a new context for ancient material, it is also a reminder of the purpose of the piece as a type of ricercar to test a pitch setting, whether testing the tuning of an early Irish wire strung harp, or a twelve-tone setting on modern lever harp. Finally the climactic closing section brings together ascending transpositions of all twelve possible quartal hexachords, and Slonimsky’s twelve-tone chord (bars 64–65), both voiced across the full range of the instrument. My thanks to Jennifer McCay and the Association of Irish Composers for their production of an explanatory video about this work, which can be seen at http://www.aicnewmusicjournal.com/articles/composers-commentaries-issue-3-anne-marie-ofarrells-chromatétude. The duration of Chromatétude is 4’00 minutes.